The cotton/poly blend using premium materials provides a lightweight soft feel while utilizing moisture wicking technology for superior comfort. 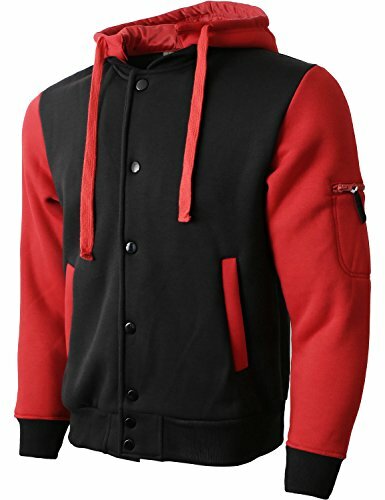 This letterman jacket features a hidden button detachable hoodie, a flat knit drawstring, and a lined with a moisture wicking inner layer for the best experience when wearing the hood. This varsity jacket features two spacious front pockets and a zipper sleeve pocket for all your personal items and storage needs. Ribbed knit elastic collar, wrist cuffs, and bottom hem makes sure that the jacket hugs your body, keeps in the warmth, and keeps out the cold weather and wind. Machine wash gentle cold / Tumble dry low / Wash colors separately / Do not bleach / Cool iron if needed. Available in sizes S-3XL in four different colors. |WARNING| Hat and Beyond is the sole distributor for this particular item and design. Please check the seller's name before placing an order. Products that are sold by other sellers are counterfeit products and these unauthentic products may have size, color, and other quality issues. We are not responsible for return or exchange if ordered from other sellers. Snap button front enclosure / Button detachable hoodie. Two front slant welt pockets / Left sleeve zipper pocket. Ribbed knit elastic collar, wrist cuffs, and bottom hem. Hood built with moisture wicking inner layer and flat knit drawstring.